A lot of people think that wearing vintage pieces means looking costumey, uber boho, rockabilly, or pin-upy. Obviously, I’m here to tell you and show you that this is not the case. I pride myself in finding vintage pieces that I can mix with non-vintage pieces for a modern and unique look. When I found this blouse, I knew it was one of those pieces that I would wear over and over again. 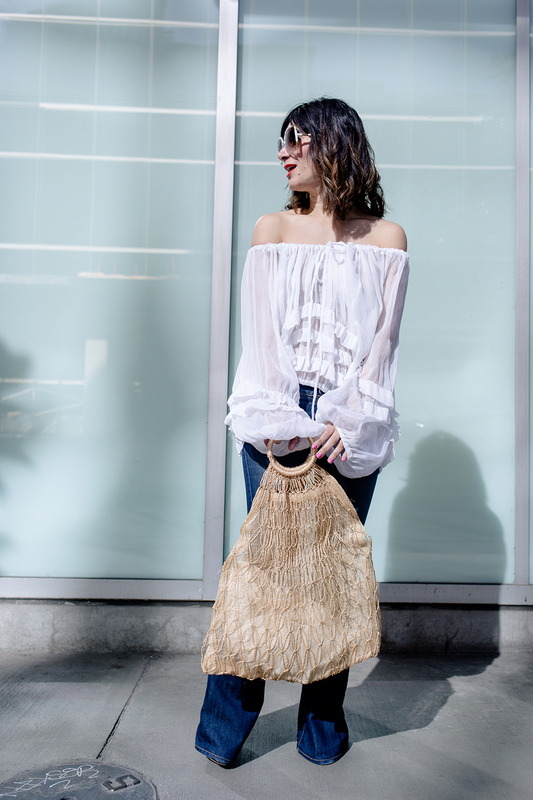 It’s perfectly sheer and I can wear it off or over the shoulder, plus the ultra flowy sleeves are dreamy! I’m wearing a vintage sheer top, J. 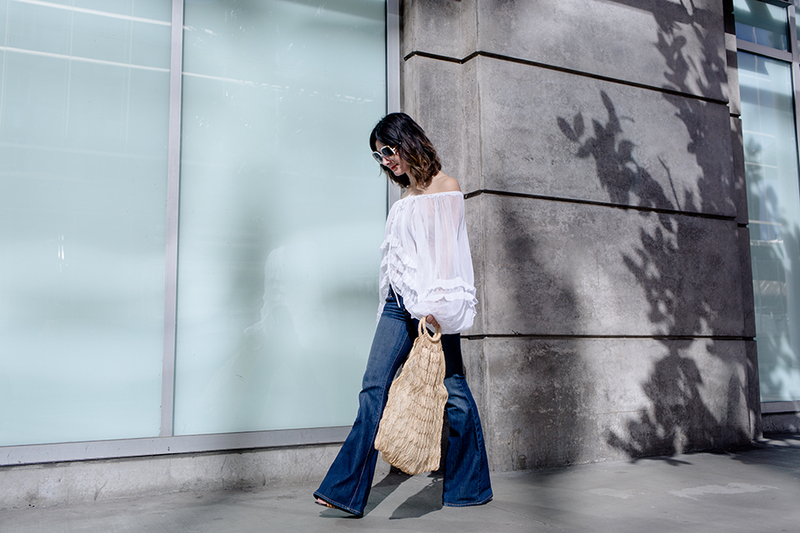 Brand flare jeans, vintage bag, VLM Jewelry harp ring, and vintage Ted Lapidus sunglasses. That white top is perfect for summer! Such a perfect top for the warmer months! Loving your bag too! This top is gorgeous! I love great vintage finds like this one! oh my gosh, I love this top so much! This is so, SO gorgeous! Absolutely adore this whole look! This top is gorgeous!! So perfect for spring! This top is so unique! Love all the ruffles! Such a great top on you! Love this look, has me wishing for warmer weather! I believe I have a blouse like that, off white. Glad I saved. How great! It’s such a beautiful top, I don’t think I’ll ever part with mine! Yes I agree, vintage shopping is the way to go to find unique cool pieces and it’s not what you picture vintage of being. Anyways, love how light and airy the top is, it’s definitely perfect for spring weather and even summer!